Bikes need to be cleaned immaculately before shipping (especially when trying to get them into Australia. MDF or steel crates are ideal as they get around quarantine issues and the need to use certified wood (MDF is not considered wood). May shipping companies will have spare certified wood crates that they can sell. 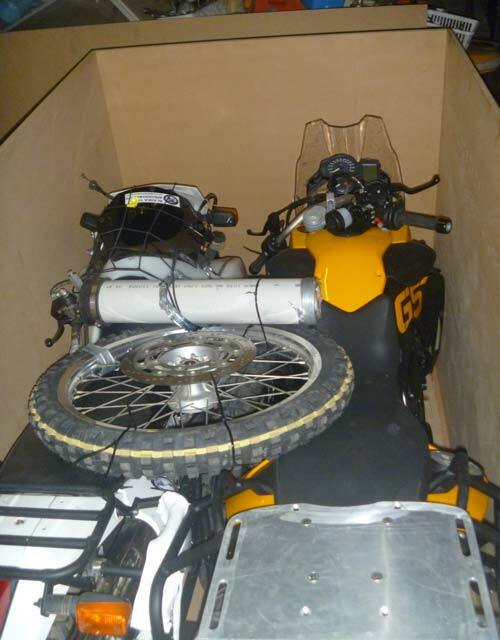 Packing the bikes into a single crate is one of the best ways to save on freight. Airfreight costs are calculated on volumetric weight (or actual weight if it is greater). Volumetric weight in kg = L x W x H (m) x 167. Easiest way to reduce the dimensions of the bike is to remove front wheel, mirrors, windscreen handlebars and anything else that dramatically adds to the dimensions of the bike and is easy to remove. Just remember you are probably not going to have any help at the other end to put it back together. This is something to keep in mind when removing the front wheel of bigger bikes but if you’re friendly enough there is normally a forklift driver around that will assist. 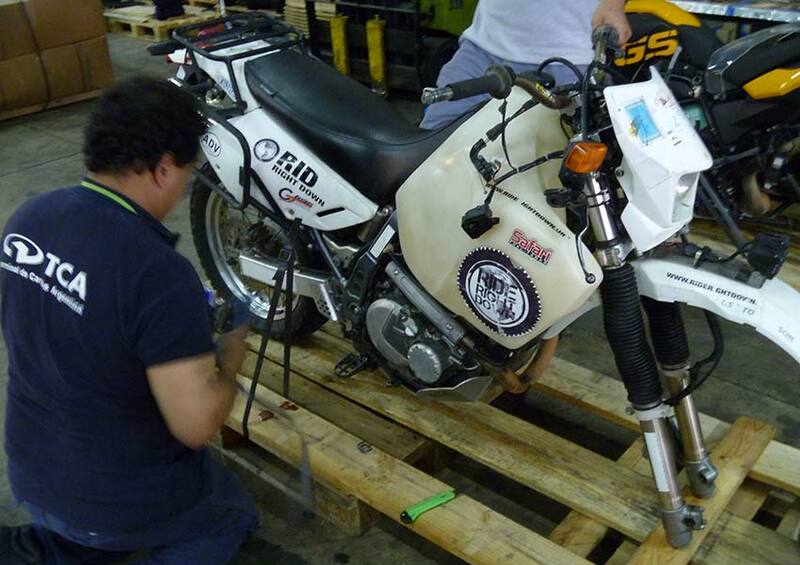 We went to a lot of effort to secure the front axles through wood however we saw a much easier way shown in the pics of the bikes leaving Argentina. Likewise the use of plastic strapping to secure the bikes like they did is much easier to set up and take up less space. Best to let your tyres down a little to help prevent movement and allow for changes in air pressure. Most shippers will want the battery disconnected and the majority of the fuel drained. In our experience we were fine to leave just enough fuel in reserve to get us to the first petrol station. Shipping instructions from Horizions Unlimited. Info on actual shipments from Horizons Unlimited. 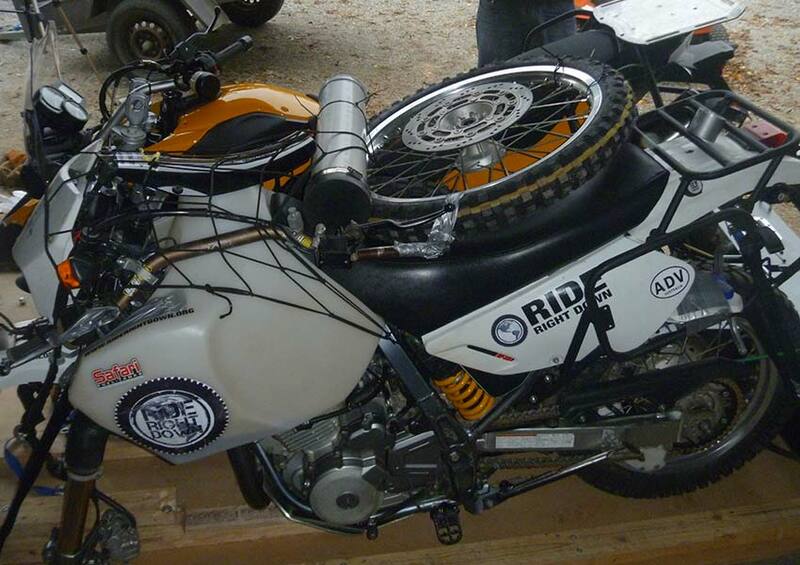 BMW 800GS and DR650 together on our MDF base. 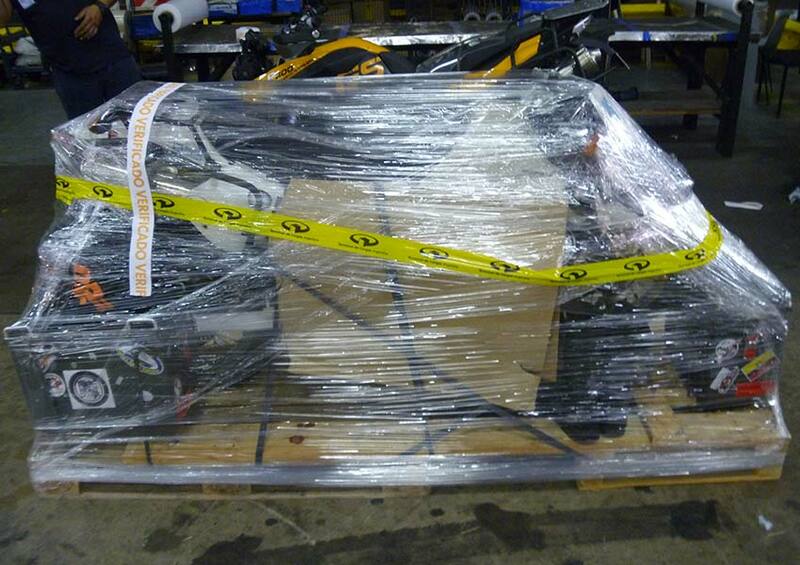 DR650 Packed up and ready for the sides of the crate. DR650 on treated wood crate built by shipper. 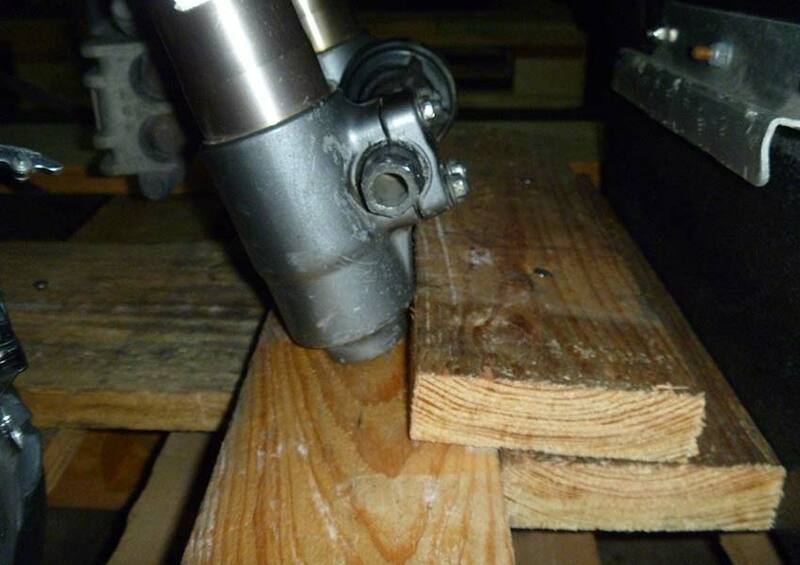 Fork stop on treated wood crate. Much quicker and easier than bolting axle through wood. 800GS on treated wood crate built by shipper. Handlebars were taken off after this pic was taken. 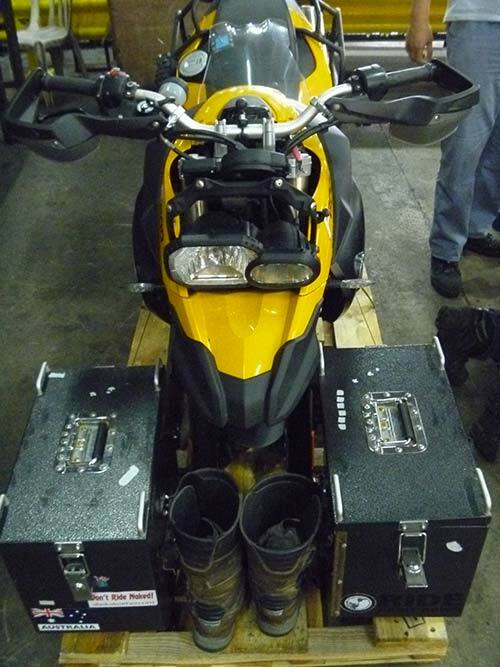 DR650 all packed up and ready to be shipped.